Drawing from about 5,000 public comments on its boiler Maximum Achievable Control Technology rules proposal released in April, the EPA overhauled the standards for major and area source boilers, as well as solid waste and sewage sludge incinerators. While the final rules for EPA's boiler Maximum Achievable Control Technology released Feb. 23 are an improvement over last year's proposals, the Biomass Power Association says the rules still fall short of the sweeping changes the industry hoped for. H.R. 1, the federal spending bill passed by the U.S. House last week, proposes to rescind $25 billion in unobligated funds from the U.S. DOE's Loan Guarantee Program, including $100 million for a 20-megawatt waste-to-energy plant in Montgomery, N.Y.
Farmer-owned cooperative MFA Oil has teamed up with Aloterra Energy LLC to facilitate the growth of miscanthus for heat and power, and eventually liquid fuels. 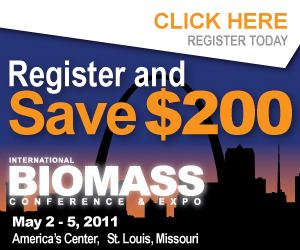 MFA Oil Biomass will organize local farmers in Missouri and Arkansas to grow 50,000 acres. A 5-megawatt, 60,000-square-foot biomass power plant planned for tribal land in the Wisconsin city of Ashwaubenon will instead be developed in Green Bay, after the developer was contacted by a number of parties who offered other project sites. Private equity fund manager Energy Investors Funds Renewable Energy Holdings LLC recently expanded its portfolio of landfill gas-to-energy operations by acquiring Oakfield, N.Y.-based Innovative Energy Systems and its 11 operating plants. Envergent Technologies, a Honeywell company, announced that its technology will be used by Crane & Co. to convert biomass feedstock into a renewable oil to heat and power Crane's Massachusetts facility where it produces paper used for U.S. currency. Laidlaw Energy Group Inc. is looking to expand its operations, having recently executed a letter of agreement to purchase a 14-megawatt biomass power plant in California. The company has two biomass power projects under development on the East Coast.